When Wes Philbrick developed this summer’s menus for the Black Point Inn in Scarborough, the executive chef at the seasonal hotel sought to spice up the plant-based options on The Chart Room’s lunch menu. “I wanted a vegan option that would be more exciting,” Philbrick told me. He did some research into vegan recipes and discovered jackfruit, which grows in tropical and sub-tropical climates. The Black Point Inn’s executive chef Wes Philbrick discovered that breaking down a whole jackfruit is a “labor-intensive” and messy undertaking. Instead he buys it vacuum-sealed. Asian markets carry whole jackfruits and occasionally Whole Foods might have one. Fresh jackfruit has a tough, outer rind. When cut, the fruit oozes a latex sap that can’t be washed off, meaning hands and knives must be coated in oil while cutting it apart. Produce Retailer reported last fall on rising interest in whole jackfruit. The story quotes a fresh jackfruit wholesaler who says he’s seen a 50 to 75 percent increase in sales over the past four years. But packaged jackfruit is easier to find and prepare. A handful of companies sell ready-to-eat pouches of jackfruit in a variety of sauces. Look for them in the supermarket alongside refrigerated plant-based meats. One such company is Upton’s Naturals, which is expanding the size of its production facility in Chicago sixfold. 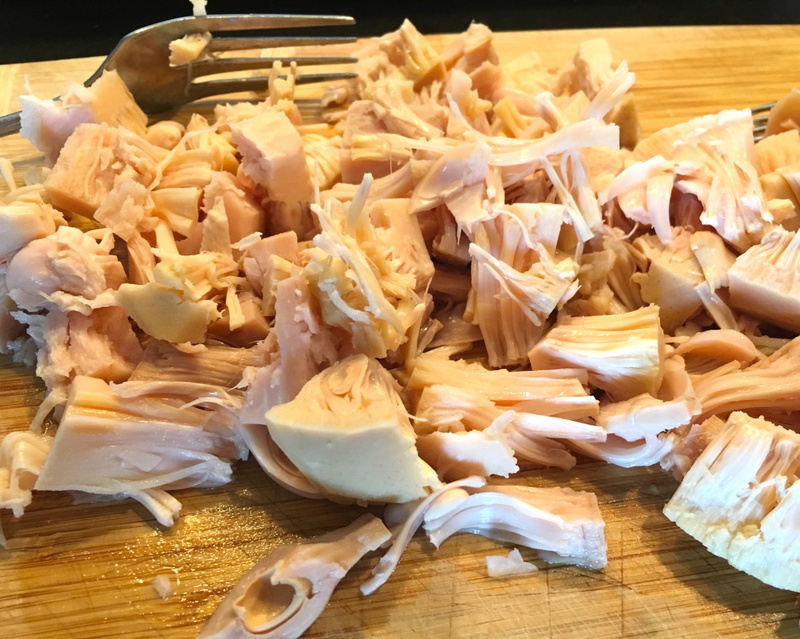 Plain jackfruit, either canned, frozen or vacuum-packed (and labeled “young,” “green,” “unripe” or “raw”), is what most Maine restaurants use and is the more accessible option for home cooks. You can find it in Asian markets, Trader Joe’s and online. Ripe jackfruit (either canned or fresh) is not a substitute for the unripe fruit. When it comes out of the can, young jackfruit tastes briny, similar to canned artichoke hearts. The chunks of young, green jackfruit shred easily when using two forks to pull the flesh apart. I like to sauté an onion, then add the shredded jackfruit along with black pepper and paprika. I let the mixture cook for 10 to 15 minutes, stirring regularly, then add my homemade barbecue sauce. I serve the barbecue jackfruit on hamburger buns with vegan mayo, red cabbage and pickled banana peppers. The result is pulled jackfruit tacos topped with apple braised cabbage, pineapple salsa and pickled red onion. Philbrick said sales started out slowly, with diners asking a lot of “what is jackfruit?” questions. But once people try it, he said, they like it and come back and order it again. “We went from selling one or two on a busy lunch shift to selling eight to 10,” Philbrick said of the tacos filled with a fruit few Americans have ever heard of, let alone eaten. But during during the past decade, vegans across the United States have embraced jackfruit, a relative of figs and mulberries whose individual fruits can weigh up to 100 pounds. Recipes for jackfruit proliferated in vegan cookbooks and blogs. The most popular ways to use jackfruit is as substitutes in barbecue and pulled pork style dishes, but it is also used to make vegan tuna salad, crab cakes, burgers, pot pies and grain bowls. 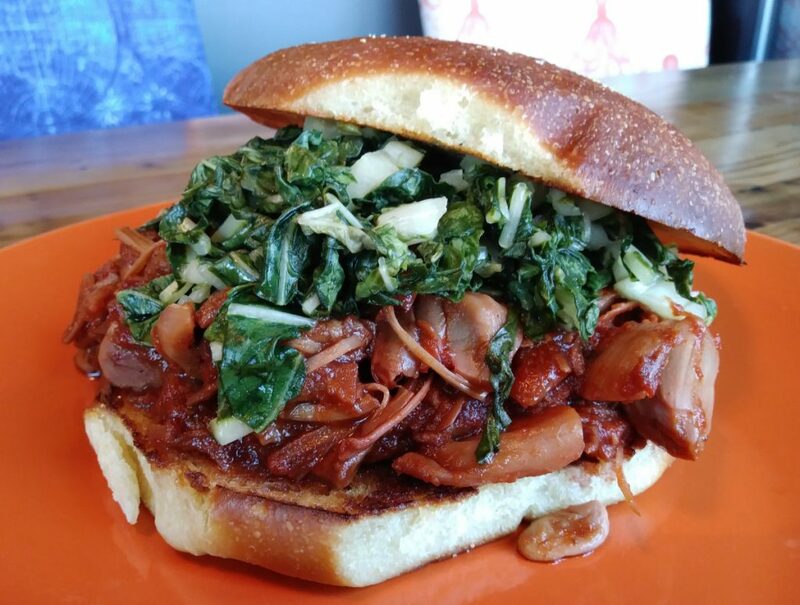 The Sinful Kitchen in Portland added barbecue jackfruit to its all-day brunch menu earlier this year. It can also be substituted for pulled pork in The Bomb sandwich, added to the non-vegan huevos rancheros or served as a side. Jackie Hardin has seen this popularity first-hand. She co-owns Yeto’s in Biddeford with chef Bryan Casale, and roasted jackfruit has been on the menu since the restaurant opened in February. Yeto’s kitchen staff starts with young, green jackfruit that comes in a vacuum-sealed package. It is drained, rubbed with a spice mix, then put in the smoker for about 20 minutes until it turns dark on the outside (or “barks up” in barbecue speak). Finally, cooks pull it apart to resemble pulled pork and cover it in barbecue sauce. After draining, canned young, green jackfruit is easily pulled apart with two forks. At the Sinful Kitchen, they take young jackfruit, cook it in butter, shred it and add barbecue sauce. When diners ask for a vegan version, the kitchen staff cooks the jackfruit with olive oil. Similarly, at Fork & Spoon the kitchen staff “shred it, add barbecue sauce, cook it down and that’s about it,” Dean said. But the big question: Does it taste like pig flesh? Which is either a good thing or a bad thing, depending on your point of view.